Like a lot people, Jim Kowalczik has an animal that can get a bit too affectionate. In his case, however, that animal happens to be a 1500-pound Kodiak bear. 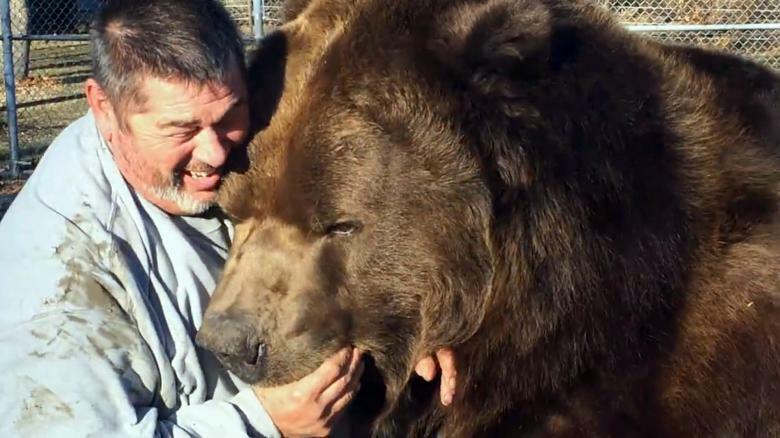 Kowalczik and is wife Susan are the founders of the Orphaned Wildlife Center, a New York animal sanctuary for bears like Jimbo, whose slobbery devotion was captured in a recent viral video. With focus on rehabilitation, the nonprofit says it aims to release the wildlife they care for. Unfortunately, Jimbo and 10 other bears at the center were exposed to too much human contact as orphaned cubs to successfully return to the forest. "Our primary purpose is to release these animals into the wild," Director Kerry Clair told The New York Times. "We only keep them if there's some problem." But while Jimbo might look like a 9-foot-tall dog, the center warns viewers that bears are powerful wild animals, not pets. "This bear was born in captivity and has lived with this man for 21 years," wrote Orphaned Wildlife on Facebook. "But animals are still always to be respected for what they are capable of." Responses to "Big Bear And His Big Rescuer Are Perfect Friends "